The two Killdeers who have laid claim to the gravel road next to the Youth Farm were on patrol the other day, marching back and forth in the short grass sprouting amid the pebbles. When I inadvertently crossed into their territory, they swarmed around me like MPs at a checkpoint, yelling at me to move away or else. Ordinarily, when I find I am bothering birds in their natural habitat, I leave. I figure I’m in their home, and they make the rules. Besides, after years of political doorbelling and yard-signing, not to mention Girl Scout cookie-selling, I know when I’m unwelcome. So usually, I pass on to the next yard without demur. But Killdeers have expansive ideas about their home territories. I’ve had Killdeers chase me halfway around the Loop Trail, alerting all and sundry to hide from this dangerous, bipedal interloper with the floppy hat and the folding camp stool. Their voices are piercing and loud, their manners pushy and rude. When they get revved up, all the other birds within hearing disappear. It’s annoying. No good. “Ki-ki-ki-killeer,” they clucked, skittering around my feet like ankle biters trying to decide the right spot to bite. I was about to advance another argument, when suddenly the Barn Swallows soaring overhead gave their distinctive, two-note alarm call. The Killdeers and I froze, knowing a raptor was near. Sure enough, a Merlin rocketed by at head height, its wings bent back like a Stealth jet on turbo-chargers. After it passed, I glanced down at the Killdeers at my feet. They weren’t moving a muscle. These normally twitchy, can’t-sit-still birds might as well have been stuffed, they were so immobile. The Merlin cruised back, its ominous shadow skimming the short grass like Death itself with a scythe. 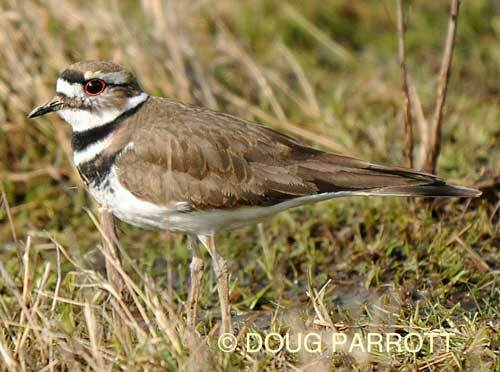 A juicy Killdeer would have made a perfect meal for the falcon, and my two compadres knew it. So they stayed absolutely still, counting on their brown, white, and black feathers to blend into the background, making them invisible. In reality, they were out in the open in plain view. If they had moved, they would have died. But they had faith in their feathers, and the shadow of Death passed over them harmlessly. In these days of recession and uncertainty, perhaps it’s wise for us to recall our own “feathers” and to have faith in the skills, strengths, and beliefs that give us the power to overcome. This entry was posted in Uncategorized on September 15, 2012 by constancesidles.